Snakes are attractive and intriguing to watch, and if docile... they are fun to hold! Snakes are fascinating to watch as they make their way gracefully around their enclosure. They are elongate reptiles that are flexible and legless. Snakes are found in the Suborder Serpentes and both the word serpent, and the word snake, are derived from terms that mean "to crawl” or "to creep”. Legless lizards look similar to snakes, but snakes differ from all lizards because they don’t have eyelids and external ears. Yet there ar a number of ways that snakes are similar to lizards as well as other reptiles. They are ectothermic, meaning cold-blooded, and they have overlapping scales. They are also amniotic vertebrates, meaning they have terrestrially adapted eggs and a backbone or spine. In the animal world there are approximately 2,900 distinct species of snakes. They are found on all the continents except Antartica. Most types of snakes are non-venomous, and those that do have venom primarily use it for hunting rather than for defense. Snakes range in size from as small as 4 inches (10 cm) to over 30 feet (9 m) in length, but most are fairly small, only reaching about 3 feet (1 m). 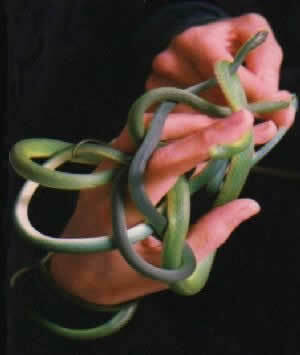 Snakes kept as pets are generally less than 5 feet in length and many make good pets that are docile and easy to hold. Snakes are quiet and easy to care for. They are very clean and virtually odorless. Other than the large boas and pythons, they don't eat much, so they are also inexpensive to feed. There is a wide variety of non-venomous snakes to choose from for a pet. The list of Snakes below includes popular pets as well lesser known species and venomous snakes. Each snake guide provides snake identification, snake pictures, in-depth species information, and information about living with them. Snake care covers housing needs, diet and feeding, activities and behaviors; tips for handling snakes, and breeding information. When getting your first snake, its a good idea to start with a common species that is smaller in size. Some popular common snakes of this sort include the king snake, corn snake, garter snake, rat snake, milksnake and ball python. Larger snakes, like many of the boas and other constrictors, the more exotic snakes, and venomous snakes are best left to experienced keepers. The care and handling of larger snakes requires more space and strength. They are more costly to maintain and can be potentially dangerous. The more exotic snake species are often less understood and generaly there is less information available about keeping them in captivity.